Though the official name for this bread is Oatmeal Sandwich bread, it doesn't contain Oatmeal but plain rolled Oats. 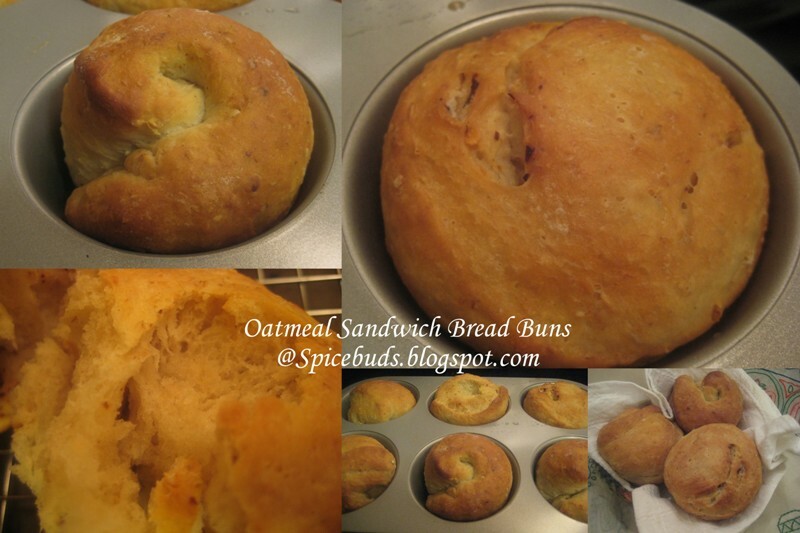 I adapted this recipe from King Arthur's Bread Flour bag with minor changes only so I didn't felt like changing it's name. But telling you the truth, at home it was called bread just plain bread because sometime it's better to not mention everything to 9 yr. olds. I made it yesterday for dinner & I'm posting about it today, so that means it was not only good but really good def. a keeper recipe specially if U are new to bread making, as this is one easy recipe and I wanted to save this recipe before I loose it with all the minor changes I made. As I'm already trying hard to figure out one green spaghetti recipe my daughter asked me yesterday to make again, because it doesn't happen everyday that your kid ask U "can U make that green spaghetti again which was not very green, didn't look good kinda but I loved it". Note : Actual recipe also have an optional ingredient 3/4 cup of raisins/currants. I simply followed the recipe and as per that Combine all the ingredients in a large mixing bowl to form a shaggy dough(means it's still not smooth ). Knead dough, by hand (10 minutes) or by machine (5 minutes) until it's smooth. I used stand mixer here. Once the dough is done I normally take the dough out of the mixing bowl & grease that same bowl & leave the dough covered in that same bowl for resting. Recipe ask for 1 hr. till it become quite puffy though it may not double in bulk. Mine was resting for 1 & 1/2 hr. & was almost doubled. To Shape : Lightly grease the loaf pan/pans U are planning to use. Transfer the dough to lightly floured surface, slightly punch & shape it into desired size. 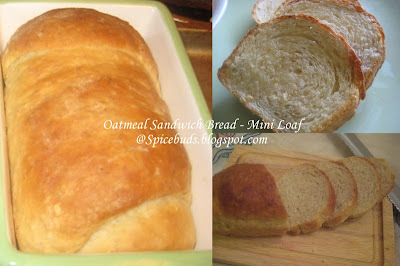 This recipe is for one 9x5 size loaf so if U want to do that after U shape the log place it into 9x5 inch loaf pan. But I planned to do it differently. I cut the dough into five equal parts 2 of them were rolled into small loaves, I used ceramic mini loaf pans, size from top of these pans is 5x3 & height is 2 inches. Rest of the 3 parts were again divided into 2 each so 6 in total. These went into large size muffin tray(muffin capacity in these one is almost double the regular size muffins) . 3 shaped like small log 3 just rolled into ball. Cover the pan with lightly greased plastic wrap and let the dough rise for 60-90 minutes (I spent only 60 minutes here). 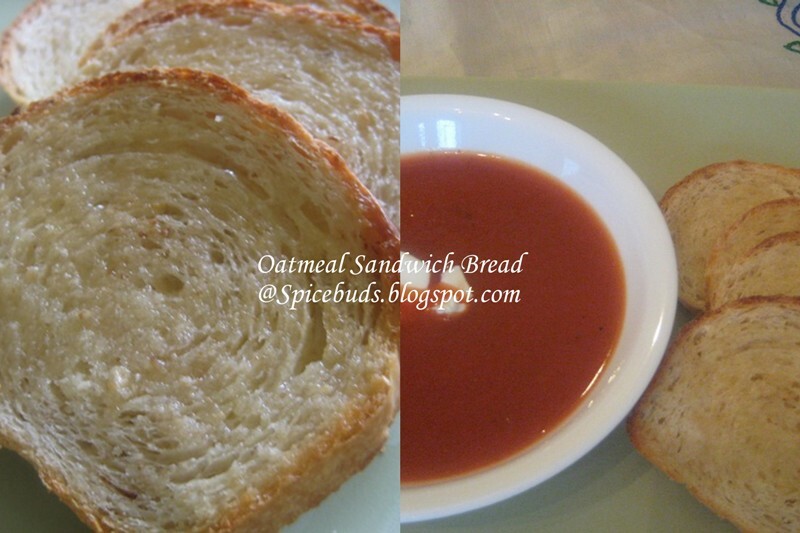 Bake the bread in a preheated 350 degree F oven for 35-40 minutes for regular 9x5 inch loaf. But in my case I baked 25-30 minutes, 25 minutes for muffin tray/buns & 30 minutes for mini loaves. Towards the last minute of baking I brushed them with the melted butter & baked for another minute or so. Notes : As I'm always little unsure impatient when I'm baking bread so I did took out one bun out of the tray & without waiting I opened it up from the centre & it felt good. Mission accomplished.